Today was Day #6 of Chocolate and Truffle Theme Week. I would like to honor truffle pigs everywhere -- especially live ones that help to root out black truffles. These fungi/tubers resemble chocolate truffles (the small, round chocolate variety). 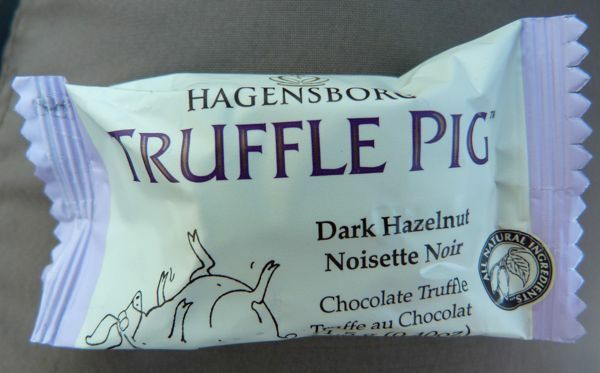 I could not think of a better way salute to these pigs than a Truffle Pig'lette -- an individually wrapped, bite sized Dark Hazelnut Chocolate Truffle from Hagensborg Chocolates (Burnaby, British Columbia, Canada). 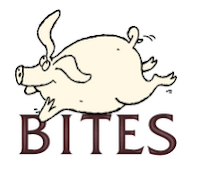 Made with "All Natural European Chocolate," this little piggy had a smooth, melty texture. The hazelnut butter was very light; in fact, I'd say it was almost difficult to detect. 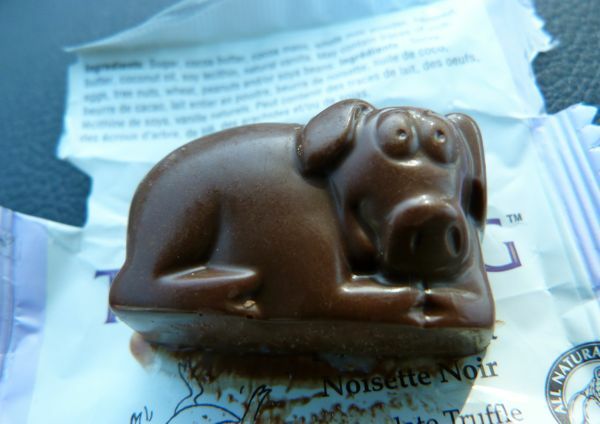 Love the truffle pig illustrations on the Hagensborg bars and chocolates. These pigs really do look like they're having the time of their life.